RGoodman Associates is a Boston-based organizational development consulting firm committed to building the capacity of organizations to sustain high performance. Contact us about how we can meet your organization's development and performance objectives. Read our newest article: Influencing Others: What Gets in Your Way? 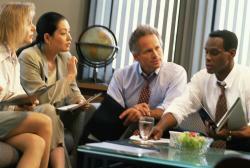 What is Executive Coaching? Read about our approach. Explore how we customize Team Development Initiatives to address your needs.